Liverpool were one of many clubs offered Neven Subotic over the summer, but Jurgen Klopp wasn’t interested in pursuing anyone other than Southampton’s Virgil van Dijk, who proved unattainable. The Serbian defender was very, very highly rated around five years ago, winning back to back titles under Klopp with Borussia Dortmund – starring at centre-back alongside Mats Hummels. Speaking to The Mirror Football Podcast, reporter Tom Hopkinson said: “Oh there were lots [of defensive targets]. “I’m not saying don’t go for Van Dijk. “Van Dijk is an excellent defender but when that failed surely there was somebody they could have picked up for £20million? 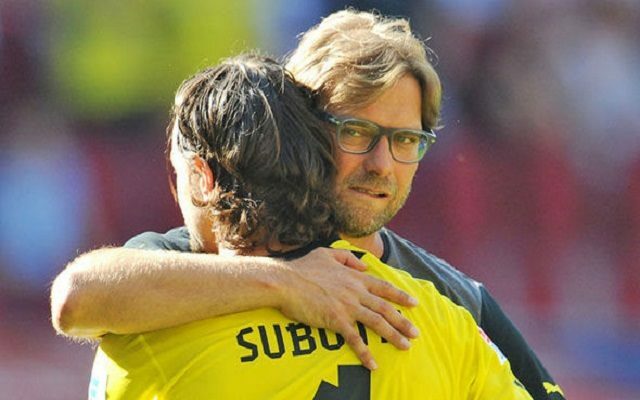 “Subotic, or somebody like that? “There was a mandate to try and bring Subotic to the Premier League during the transfer window. “He might not be the answer to Liverpool’s problems, and he might still have a rick [injury] in him. This term, under Dortmund’s new boss Peter Bosz, Subotic hasn’t played a single game and is out of contract next summer. While our decision not to buy a new central defender was clearly a mistake, we’re glad we didn’t target Subotic, who’s clearly over the hill. Our decision to turn down Davinson Sanchez and Kalidou Koulibaly is harder to understand however. The former has done excellently at Spurs and the latter is one of Serie A’s most recognised and respected defenders. Until van Dijk becomes available though, Klopp has a crocked Dejan Lovren, Joel Matip and Ragnar Klavan to choose from.